There is just something about it that I just can’t get enough of. Do I love that it always gets everywhere and sometimes seems impossible to get rid of? Does that stop me from loving it? So after seeing this pin on Pinterest, I knew I had to make some glitter clothespins of my own! Then I saw another pin with the idea of gluing tacks to the back of them, which was perfect, because after gluing on the tacks, I was able to hang them up on my writing board! I am excited that I won’t have to staple holes through my students writing anymore… it will be so much easier to just hang them up with the clothespins! Also, I finally finished my “READ” letters! I bought a set of flat letters a while ago, but then decided that I wanted them to be able to stand up, so I traded them for the thicker letters! This project has been on my to-do list since the beginning of summer, so I am so excited to finally have it done!! I covered them with bright colored fabric that I got at Joanne’s. Also, unrelated to making anything, look what I got in the mail!! My Erin Condren teacher planner! I am so excited because I fell in love with the Instagram cover, but they only have it on their site for the Life Planner. Thankfully they are so wonderful and they said that they would be able to make my teacher planner with the Instagram cover! I LOVE how colorful it is! And my new phone cover! Of course, I still feel like a have a bajillion things left on my list to get done before school, but I still have 3 weeks left to prepare! I’m sure by now almost everyone has heard of Tara’s Monday Made Its, so make sure you head over there to see the rest of the fabulous creations teachers made this week! Your glitter clothes pins are so cute. I've ruined many projects trying to get out staples! I love your E.C. planner. I was thinking of using an Instagram photo for the cover of my next one. I've seen a few online and I really like how they turned out. Thanks for sharing! Love the glitter clothespins with the tacks – so clever. 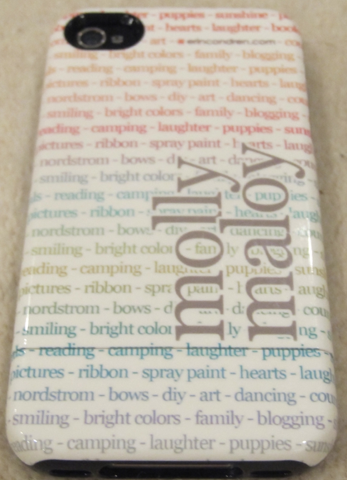 But I really want to know is – where did you purchase that amazing cell phone case? Love your fancy clothespins!! I wish I had three weeks left of summer. I go back TOMORROW…..YIKES!!! I am your newest follower. Come by my blog and check it out!! Love the glitter pins! And you planner and phone cover. 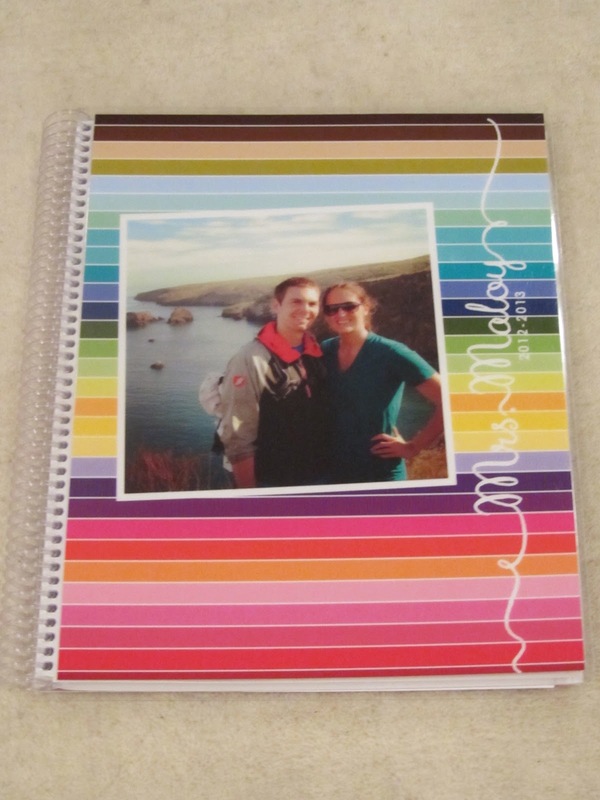 I love the Erin Condren planners but they're so darn expensive!! Love the clothespins and the planner! Eagerly awaiting my EC planner delivery and that phone cover is on my Christmas wish list this year. Yay for glitter!! I just found your blog through Monday Made It! Love your writing board. That is exactly what I want to do in my room. I'd love it if you'd come check out my Monday Made It if you get a chance! I do the same. Love your EC planers. I made the same glitter clothespins with tacks hot glued to the back this week too!! I also got the idea from Pinterest. I hope they hold up because one tack fell off already:( I would love for you to check out my Monday Made It and 100 follower giveaway! I made glitter clothes pins last week too! 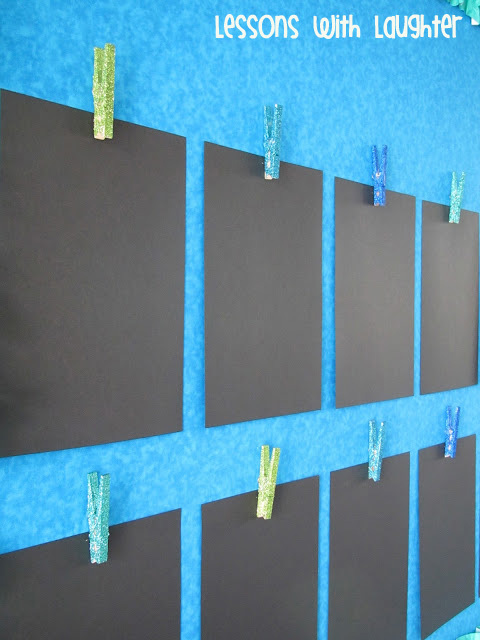 I love the colors you used and they look great on your blue wall with the black paper!!!!! I have made glitter clothes pins to! I put magnets on the back of mine. Love the colors of yours! Looks great!!! I just glued tacks on my clothespins this week! I'm SO excited too about the ease of switching out papers now!! Found you through the linky! I'm your newest follower! I love your glitter clothespins!! Come check out my bog when you have some time! Girl! I love those glitter clothespins. I'll have to find the time to actually put those up in my classroom. I am another one of those people that just loves glitter even though it is terrifically horrible to clean up!! Love your clothes pins with the tacks….GREAT IDEA!!!! The cloths pins are such a great idea! What is behind them? construction paper? Is it glued on the wall? I saw your link over at 4th Grade Frolics' blog and I had to run… race… TYPE straight over. I love your blog first of all and I am a new follower. I also love your posters names. I was so inspired by them that instead of getting ready for work this morning, I made some for my students. Just randomly found your blog when I searched for "glitter clothespin" on Google. hehe. Love your blog already! !